At least 32 people, including an infant and her mother, have died across the North and South Carolinas due to Hurricane Florence. Florence developed as the first major storm of the 2018 Atlantic hurricane season. It made landfall as a Category 1 storm after weakening from a Category 4 over the course of a few days. Recorded winds reached up to 90 miles per hour and some areas in Eastern North Carolina saw up to 40 inches of rainfall. Approximately 703,000 households in North Carolina and 61,000 in South Carolina do not have power. The mother and baby who lost their lives in the storm, in Wilmington, North Carolina. The two died after a tree fell on their home. The father was transported to a nearby hospital, according to police. Others have lost their lives due to fires, tornadoes, heavy flooding, and strong winds. Because of the high rainfall and terrain of the Southern states, landslide warnings have been advised for “the higher terrain of the Southern and Central Appalachians across Western North Carolina into Southwest Virginia,” according to the National Hurricane Center. Flash flood warnings are still in effect in areas including North Carolina, Northern South Carolina, parts of Western Virginia, Southern and Eastern West Virginia, Central and Western Maryland, Central and Western Pennsylvania, Southern New York, and Southern New England. A tornado touched down near Richmond, Virginia due to the remnants of the hurricane, as the storm continued to produce rains over North Carolina, Northeastern South Carolina, and Western Virginia. The tornado left a trail of destruction and one person dead in a building collapse. All the other employees in the building were accounted for, and one was rushed to a hospital due to a minor injury, according to the Chesterfield Fire and EMS spokesperson, Lieutenant Jason Elmore. Tornado warnings remain in effect in Northeast South Carolina, Eastern and Central North Carolina into parts of Virginia, Western Maryland, and Southern Pennsylvania. Wilmington, North Carolina, a city home to about 120,000 residents, has been cut off due to submerged roads. A threat to water service has been lifted, but emergency officials are still making plans to deliver supplies to the city. The storm, although downgraded to a post-tropical cyclone, was still massive as of Monday morning. Radar maps showed the storm over six states, with North and South Carolina completely covered. Catastrophic flooding has also continued in these areas. Cape Fear River in Fayetteville, North Carolina, is the biggest worry, according to CBS News correspondent DeMarco Morgan. The river was up to 54 feet as of Monday and is expected to crest at 62 feet on Tuesday, which is worrisome as parts of the city are already underwater. 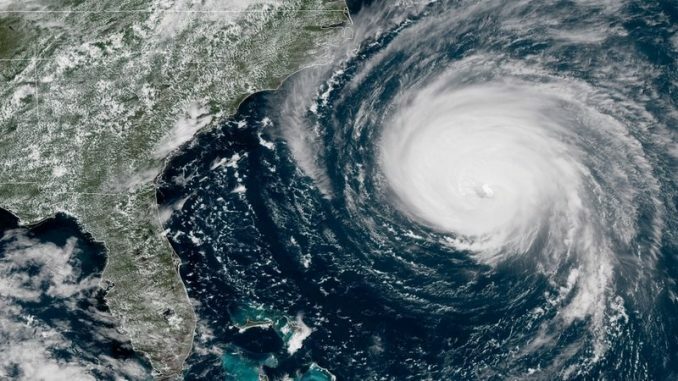 Moody’s Analytics, an economic consulting firm, said Hurricane Florence may result between $17 billion and $22 billion in lost economic output and property damage, which would put the storm in the Top 10 of costliest hurricanes to hit the United States. The firm also warns that this cost estimate could increase as more information of inland flooding is revealed.